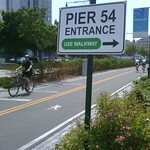 Hudson River Park is an amazing resource that evolves, year by year, into a more valuable resource. Stretching from the Battery to 59th Street, over $400 million has been invested since the late 1990s. 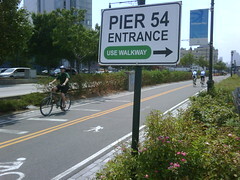 It's part of the Manhattan Waterfront Greenway a 32-mile route that circumnavigates the island of Manhattan, and transforms a long-ignored and derelict waterfront into a green attraction for recreational and commuting use. Running alongside the river for the most part, it reclaims the waterfront for pedestrians, cyclists, roller bladers, and other users of non-motorized transportation. Our popular Greenway connects to the East Coast Greenway running from Florida to Maine, then into Canada.